An intense match between Mumbai FC and Bengaluru FC ended in a goalless stalemate following an impressive draw against Mohun Bagan in the last game week. 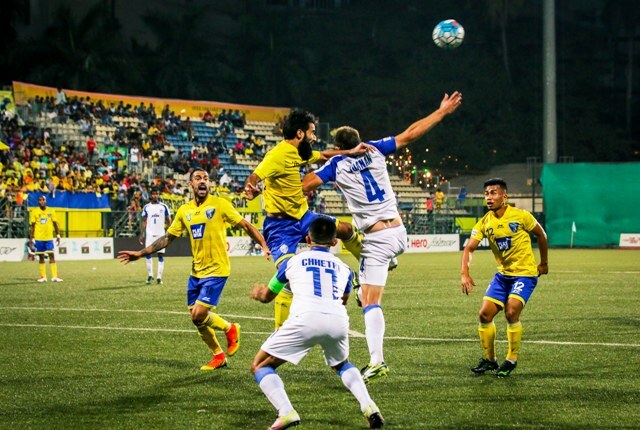 Mumbai FC hosted rivals Bengaluru FC in a crucial tie at Cooperage Stadium in the Hero I-league today evening. The match turned out to be a goalless draw as both the sides failed to deliver the knockout blow. Heading towards the match, both the sides were on a poor run of form. Mumbai FC started off brilliantly after keeping the majority of the ball possession. As the match proceeded, defending champions Bengaluru FC quickly settled into the game. The first opportunity came in the 12th minute when Mumbai FC’s Reagan Singh put across a perfect cross to Farukh Choudhary, whose header was brilliantly saved by Bengaluru FC’s custodian Amrinder Singh. A couple of minutes later, Alberto Roca’s side got their first chance when Captain Sunil Chhetri’s shot sailed over the bar. With over 3,600-odd fans at the Cooperage Stadium, the vocal members of the West Block Blues and the Yellow Brigade made sure to motivate their respective clubs. In the 27th minute, Bengaluru FC got another chance when Alwyn George and Daniel Lalhlimpuia launched a brilliant counter only to see Alwyn’s shot being saved by Kattimani. Two minutes later, Daniel saw his looping header saved by Kattimani again after Udanta Singh put a brilliant cross. The second half was more lively than the first. Both the sides got an equal number of opportunities but in the end, it was the defence which prevailed over the attack. Bengaluru FC almost scored the winner in the dying minutes when Sunil Chhetri’s effort was cleared off the line by defender Sharityar. For his impressive performance, Mumbai FC’s captain Theobald Denzel got the man of the match award. With this draw, Mumbai FC remain stranded on the eighth spot with as many points, whereas, Bengaluru FC moves to the fourth spot with thirteen points playing one match shy.